At Jack Barnes Elementary, we are proud to offer a wide variety of programs to our students. We invite you to learn more about the clubs and activities available below, and give us a call at (480) 987.7400 if you have any questions. Discovery Kids is the before- and after-school care program offered for students at Jack Barnes Elementary. 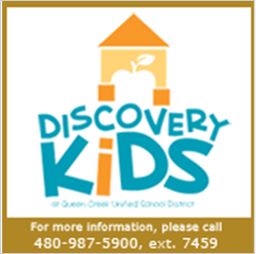 Discovery Kids provides educational and fun activities including homework time, sports, arts and crafts, science, math, and access to district technology. Care is also available on early release days and during intersession breaks. Discovery Kids is located on our campus and financial assistance is available. For additional information, please visit the Community Education page on our district website. Visit the Community Education page on our district website to register and learn more about our fun enrichment classes.